CAMBRIDGE, Mass. — Centuries before Julius Caesar sipped from a chalice and Alexander the Great raised a goblet to toast his troops, the ancients drank from festive cups made in the image of the beings they revered the most: animals. An unusual new exhibition at the Harvard Art Museums explores that primal connection between man, beast and libation. "Animal-Shaped Vessels from the Ancient World: Feasting with Gods, Heroes, and Kings" opens Friday, offering a glimpse of six dozen elaborate drinking and pouring vessels — and, through them, a window into the weird symbolism early civilizations invoked whenever they partied. Make no mistake: Our Bronze Age ancestors were well-acquainted with the concept of the liquid lunch, and they seem to have had one setting — beast mode. "By illuminating the history and making of these remarkably global objects, we invite our guests to raise a glass to what unites us across culture and time," said Martha Tedeschi, the museum's director. Visitors will journey deep into the Near East and Mediterranean past, where they'll be rewarded with priceless, rarely seen items culled from nearly two dozen museums across the U.S. and around the globe, including the British Museum, the Louvre, Vienna's Kunsthistorisches Museum, the Smithsonian Institution, New York's Metropolitan Museum of Art and Boston's Museum of Fine Arts. 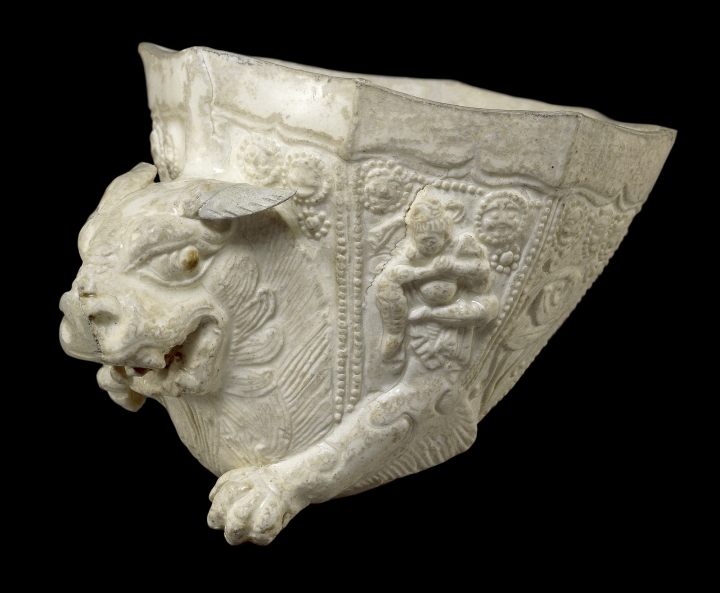 The oldest object: a terra cotta cup featuring a snarling lion from what is now known as Turkey, believed to date to the early 2000s B.C. 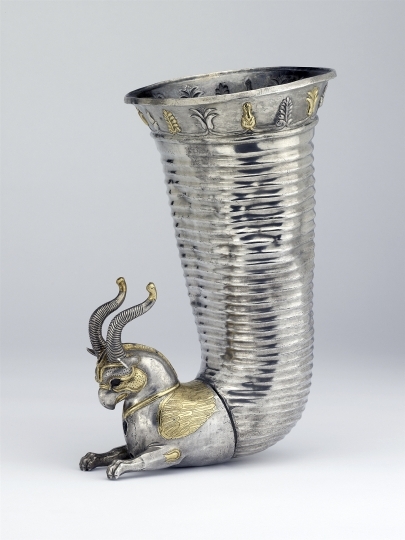 The youngest: an ornate drinking horn that Soviet leader Nikita Khrushchev gifted to President John F. Kennedy in September 1962 on the eve of the Cuban Missile Crisis. "It's fascinating how these animal-shaped vessels spread from culture to culture around the world. They were really quite fashionable," Susanne Ebbinghaus, the show's curator, said in an interview. "I hope people will become more aware of the kinds of messages that are encoded in everyday objects, and the importance of social gatherings and getting together," said Ebbinghaus, who oversees Asian and Mediterranean art at the Harvard gallery. Even the word symposium , she notes, comes from the Greek for drinking party. Archaeologists long have marveled at how much drinkware used in songs, speeches, prayers and other rituals has survived the ravages of time over three continents. Many were placed in tombs, which may explain why they endured, Ebbinghaus said. The Harvard collection includes goblets and beakers shaped like standing or reclining animals; drinking horns and pitchers made in the images of bulls, rams, lions and wild boars; and cups and chalices featuring a mythological menagerie of griffins and dragons. Fashioned from gold, silver, bronze, glass or animal horn, some of these vessels were status symbols seized as the spoils of war. Others were used as diplomatic gifts or to toast the dead as their spirits journeyed to the afterlife. Most span the Bronze Age of the third and second millennia before Christ to the rise of Islam in the 7th century A.D. The vessels are displayed alongside texts, pottery and paintings that capture how humans feasted back in the day. 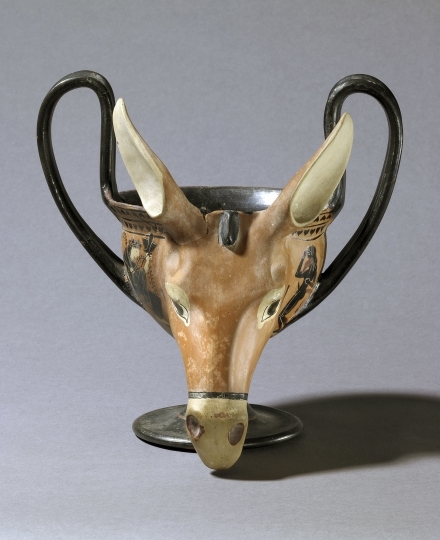 Somewhat humorously, multiple items incorporate the image of a braying donkey — an ancient symbol of overindulgence. "Recalcitrant, stupid, uninhibited," said Ebbinghaus, acknowledging her native Germany gave the world Oktoberfest. "That's what happens when you drink too much." "Animal-Shaped Vessels from the Ancient World," funded in part with a $325,000 grant from the National Endowment for the Humanities, runs through Jan. 6, 2019, at the Harvard Art Museum's special exhibitions gallery. Follow Bill Kole on Twitter at https://twitter.com/billkole . His work can be found here .